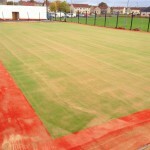 We are specialist sports pitch installers offering a number of needlepunch services for this artificial turf specification. 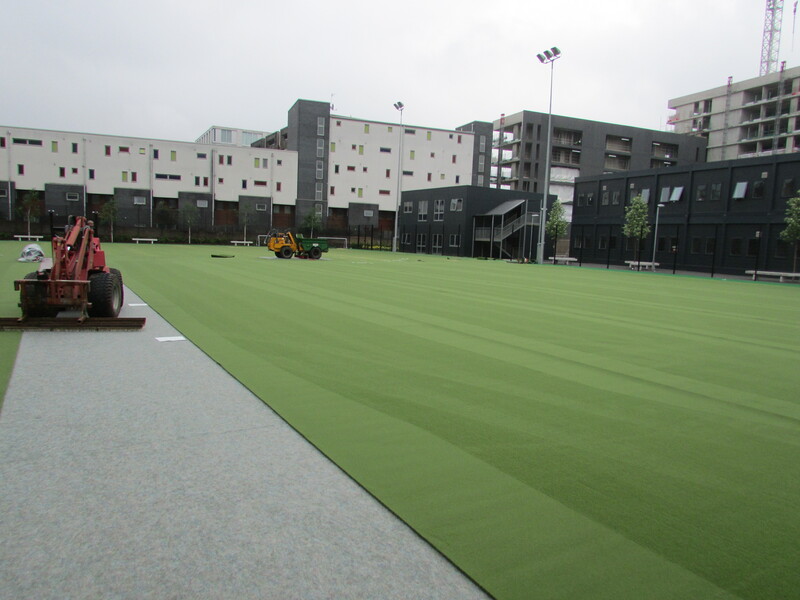 If you are looking for a durable and versatile surface for a sports facility, our needlepunch specification is definitely an option that we would recommend. 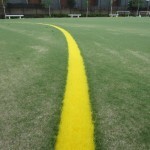 It provides excellent playing qualities for activities like football, tennis, netball, basketball and many other games. Recreational athletics tracks and long jump runways could also be installed in this material. It has become a popular flooring type for schools because it is very long lasting, and it’s also available in a number of bright colours. If you’re interested in installing one of these pitches or you’d like to enquire about maintenance of an existing facility, please contact us. Our team can complete full construction projects, as well as cleaning and repairs to these surfaces. Don’t hesitate to get in touch through the enquiry for on this page if you need some more details on the costs. What is a Needlepunch Pitch? 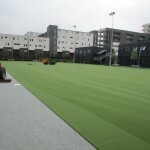 A needlepunch pitch is a type of sport surfacing made from artificial turf. It has curly yarn fibres making it slightly different from other synthetic grass specifications, but this also make it more durable and versatile. 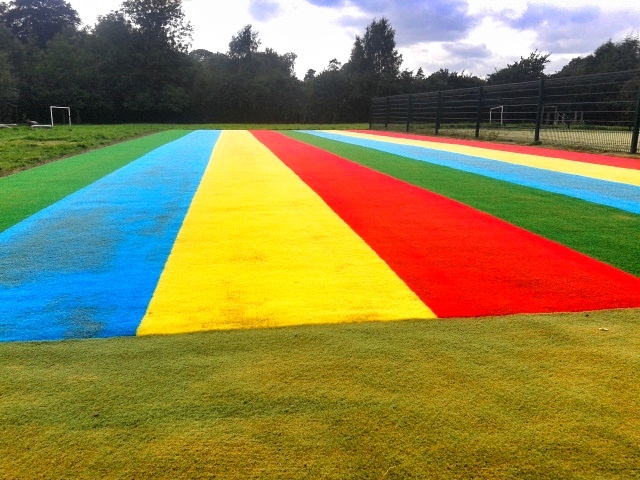 Also known as Multisport turf, the needlepunch surfacing is available in a range of vibrant colours, and features a sand infill to provide the right playing qualities for a selection of sports. 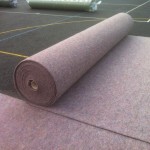 This fibre bonded artificial sport surface is a hard wearing a durable surfacing option for multi use games areas, all weather sports pitches and athletics tracks. 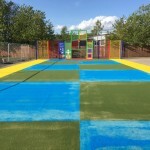 Needlepunch synthetic grass is a popular choice for primary schools as it provides a softer impact absorbing surface compared with traditional macadam or polymeric rubber sports courts. 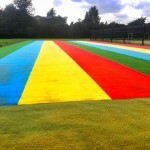 Needlepunch surfacing can also be installed in a number of bright colours to create a rainbow design which makes sport even more fun for younger children. We can carry out the needlepunch services for a range of surface specifications and dimensions to suit your individual requirements and fit within your budget to ensure that you’re happy with the final product. Our designs, specifications and quotes can all be tailored to suit your organisation and to ensure that your needlepunch sports facility has the best possible performance and safety characteristics for everyone who uses it. We are able to carry out a full installation for a brand new facility at your school, college or club. This typically includes preparing a stone or macadam sub base to create a stable foundation. We’ll then lay the artificial carpet itself in separate sections and glue these down at the joints and edges. Finally a layer of sand infill will be spread across the whole pitch and brushed through the fibres. 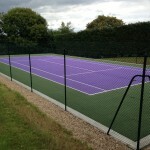 When carrying out a sport surfacing construction project it’s important to choose a reliable and experienced contractor. Conducting background checks on previous work will help give you the confidence that you will get a top quality service and a sports facility to be proud of. The costs and prices involved with carrying out various needlepunch services will of course be different for each individual project depending on the specification of the works and the existing conditions of the area. We can help you manage the costs by adjusting certain aspects of the installation process, such as the surface specification or the type of floodlighting and fencing equipment you want to install. Our aim is to make sure you get the best value service and that you are happy with the end product. Every facility we install will deliver best performance qualities and provide a safe environment for those who use it. Feel free to get in touch with us to discuss prices for our services in more detail. 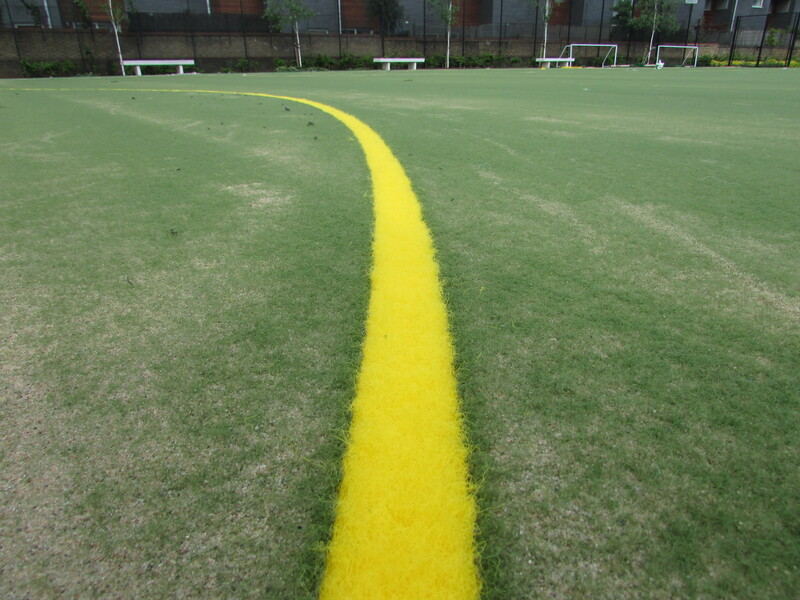 Cleaning and maintenance is also an important part of the needlepunch services we offer as it’s vital that you look after a synthetic turf sports surface properly to ensure you get the best performance qualities. The process of needlepunch surface maintenance could include regular brushing to remove dirt and debris, as well as topping up infill levels to keep the yarn fibres stable and maintain good playing characteristics. 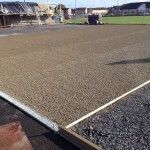 Sand infill rejuvenation can also be carried out for a Multisport surface if the sand becomes contaminated, this involved infill extraction to remove the dirty sand and replace it with new clean sand. If this type of maintenance is not put into place, the surfacing can become contaminated and lose its porosity and drainage qualities leading to the surface becoming flooded or waterlogged. This is why it’s important to regularly check for water pooling on the sports surface so any issues can be fixed and the performance and safety of the facility will not be compromised. Our expert installers can carry out whatever services you need for your facility. As specialist needlepunch contractors we have worked on many projects to install brand new sports pitches and athletics tracks. We would be happy to come up with a bespoke design if you want to install a new facility at your school or club. 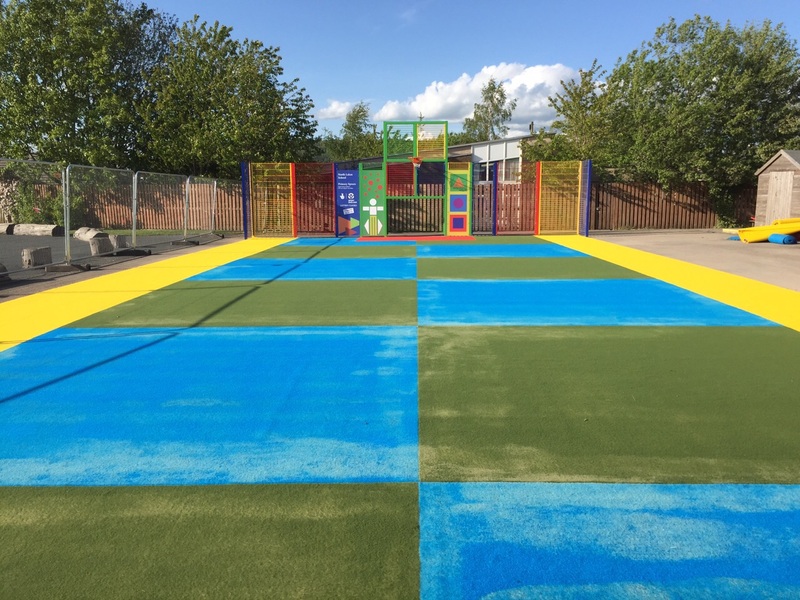 For any organisations with an existing Multisport surface, we could also carry out routine maintenance including cleaning, repairs and rejuvenation. Please contact us today by filling in the form on this page to let us know what you need. One of our experts will get back to you as soon as possible to discuss a quote for the needlepunch services. 1 What is a Needlepunch Pitch?